As babies, we came hard wired to eat when hungry and stop when full. As we get older, those lines might blur a bit in regards to the taste and smells of food, but ultimately we still use them as a guide throughout childhood. Have you ever seen a child push away a bowl of half-eaten ice cream because it was no longer satisfying for them? I’ve seen it many times! At some point, we start to ignore natural feelings of hunger and fullness. This could be due to being told to finish your meal even though no longer hungry or being told that you shouldn’t eat because you have already eaten too much. It’s also possible that starting a diet means disconnecting with your natural rhthyms in favor of giving your power and decision making over to a set of rules. Above is a hunger scale that can act as a guide for you to start reconnecting to your natural born ability to trust your body and yourself. Remember, this isn’t something new you are learning, it’s something you already know and just need to re-connect with. Ideally, stay within the numbers 4-7. As you eat regular, balanced meals every 3-4 hours to stablize blood sugar levels and fuel your body, these natural rhythms will start to remerge. Eating regularly throughout the day prevents you from dropping below a 4, where anything looks good! It’s much easier to stay level-headed about food choices at a 4 than at a 1. On the other hand, as you eat slowly and mindfully, you will be better able to listen to signs of fullness and prevent overeating. It’s very common to go too long between meals and become ravenous, eat very quickly and end up at 10, or there abouts. As you slow down with your food, you will be better able to listen to your intuitive signals, as well as feel psychologically and physiologically satisfied from your meals. Your body is also better able to digest and use the nutrients you feed your body when done in a state of relaxation. I do feel that the BEST thing you can do for your health is to slow down. Instead of blaming the food, let’s start looking at the behaviors around the food. In my experience, as you start to normalize eating behaviors with regular, balanced meals eaten in an open, accepting and relaxing way as part of self-care, many issues take care of themselves. Not only that, but you learn to love food again! Now, in my experience this quote can cause anxiety for many people. Finding that balance between restriction and chaos can feel overwhelming and many doubt they can do it. I’ll tackle that subject a little later in the week – find out how to develop self-trust. Love this article, after focusing on calorie limits so long it’s hard to let go if the "my body is a calculator " mindset. Right now I’m just focusing on maintaining my weight but I can’t help but feel guilty when I go over my maitenence. For example I ate my maitenence all week except on Friday I ate about 1000 over. How do I not stress about what my body is going to do with the extra 1000? I’m glad you enjoyed it, Samantha! Intuitive Eating is about replacing food anxiety with food and body trust. The good news is that our bodies are not a chemical equation, but much more complex than that. As the definition of normal eating says – you can "trust your body to make up for your mistakes in eating" by listening and learning from it. I encourage you to read the book Intuitive Eating if you haven’t already! Thank you for this post. Very helpful! Question: Why is it better not to wait for hunger pangs and a growling stomach before we eat? Hi Nora! Glad this was helpful. That’s a great question – everyone feels hunger a bit differently, in fact not everyone feels it digestively. 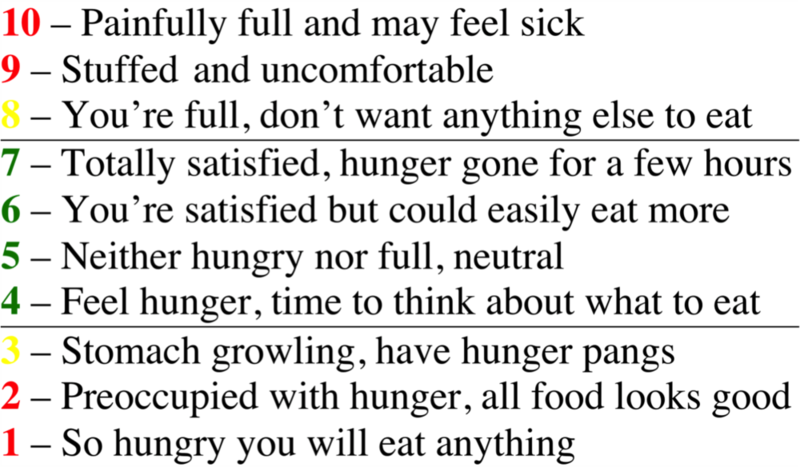 This hunger scale is to give you a guide, but definitely adjust it based on your experiences. It may be helpful to think of what is comfortable hunger and uncomfortable hunger. Do you feel more comfortable with hunger pangs or a growling stomach? If you wait too long before eating, what does that feel like? These could be helpful questions to ask yourself – remember you are gathering data about yourself!